Greetings! 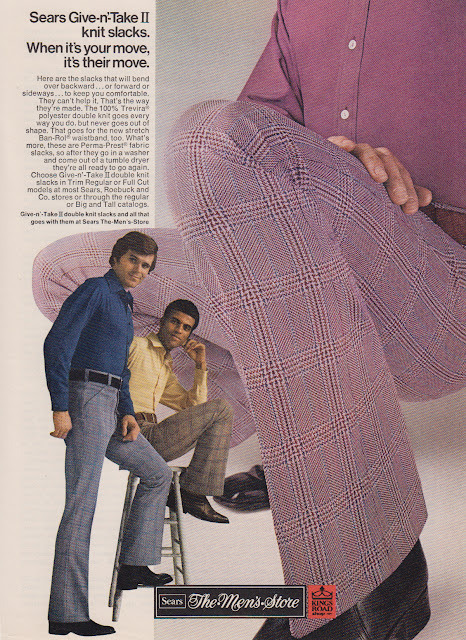 Today’s blast from the past comes to us courtesy of Popular Science in the early 70s. 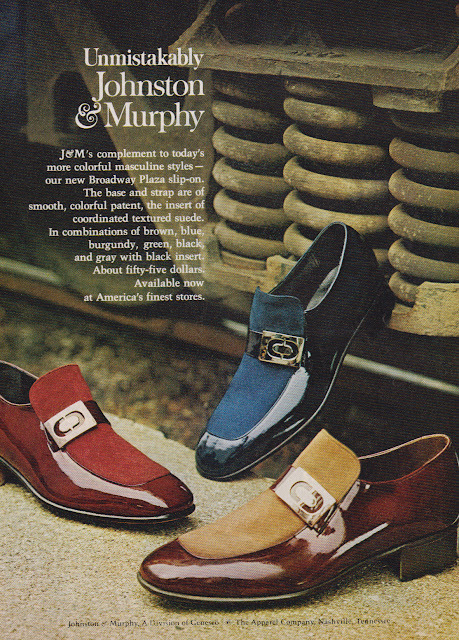 It’s interesting to me to see what the ads in a publication say about the people who read it. In this case, it’s clear that the subscribers are all of the male gender. Very male. Almost impossibly male. And they like to smoke and drink beer and drive stuff. And do things! Manly things! As a general rule, I don’t post ads for cigarettes but this one really struck my eye. 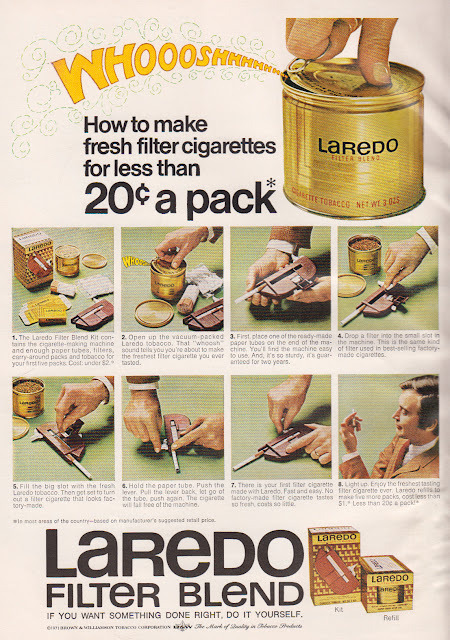 For the man who likes to smoke and doesn’t mind an 8-step process to put his smokes together I give you Laredo filter blend. It comes with a handy plastic cigarette-making machine and the pricing works out to about $.20 per pack. That’s about $1 in today’s money adjusted for inflation. 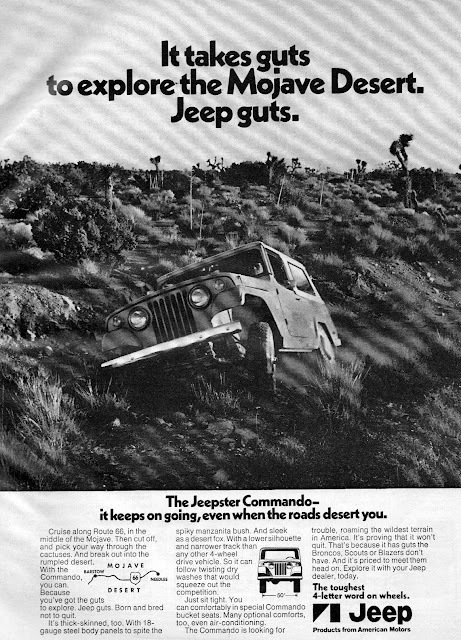 What continues to strike me about Jeep ads even from ages ago is that they haven’t changed one iota. Not a bit. 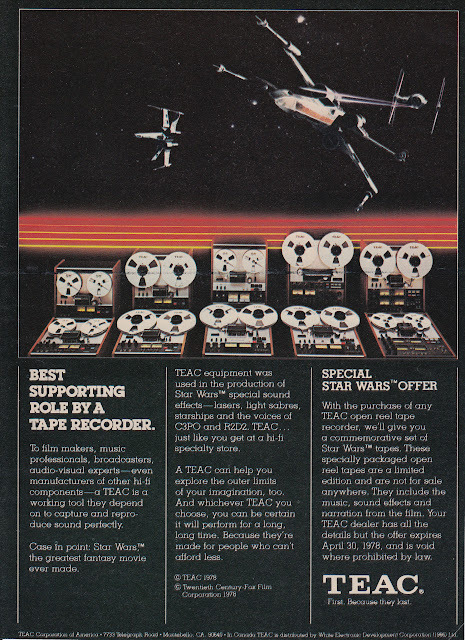 This one is blasted 40 years old and it reads like an ad from today. It’s a vehicle with guts and with the same ad guys it had in the 70s. 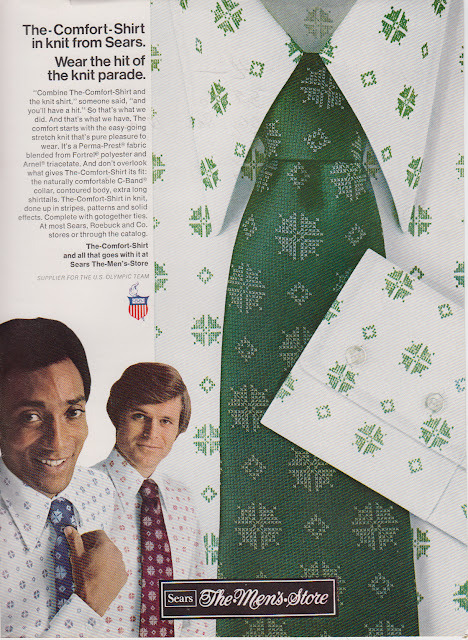 PopSci was also rife with ads for career improvement. Apparently readers fancied themselves clever enough to move up in the world but they just lacked the training. 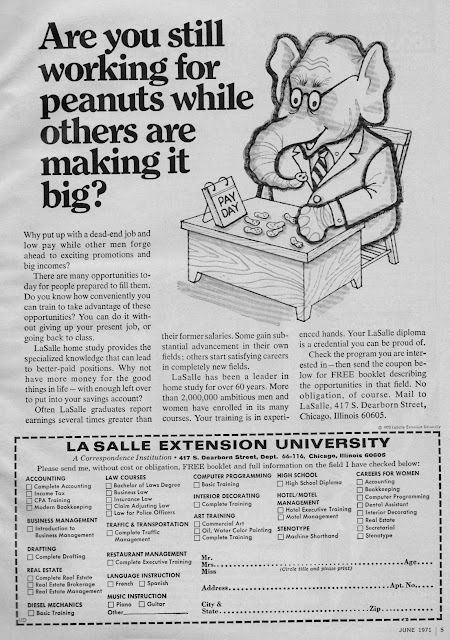 La Salle Extension university offers everything from a High School diploma to diesel mechanics all from the comfort of your home. I’m amused that they have -one- class in computer programming and it’s just ‘basic training.’ The gals get a separate set of options all the way to the right. No female diesel mechanics in these days, I guess. They could be accountants or dental assistants or secretaries. Not looking to be an accountant or clean teeth? 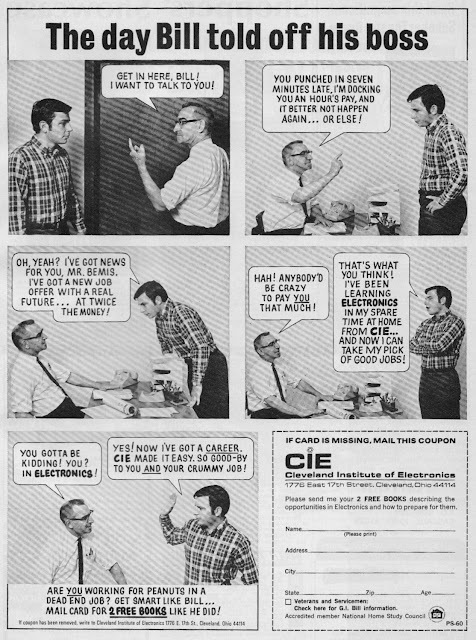 How about the Cleveland Institute of Electronics? Tell off your boss today! Learn how in handy comic-book form! Circuits not your cup of tea? Well heck. 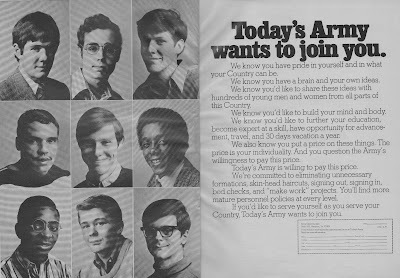 Just join the Army. There’s just no satisfying some people! Switching gears dramatically, the car ads of course made themselves known as they always do. 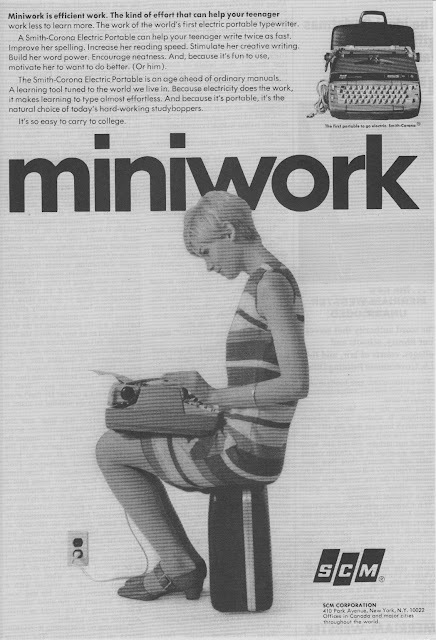 Those readers who already have a job will need a way to get there. Why not try the Ford Pinto? It boasts 25 mpg and a 75 HP motor. 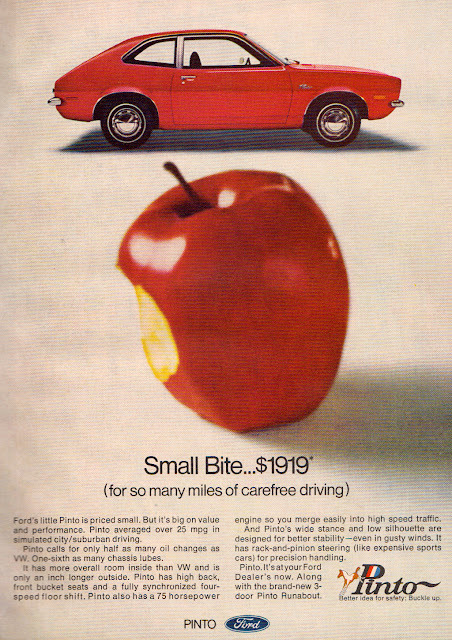 Based on the ad text it’s really trying to compete with the VW bug to which it compares itself and based on the ad photo a half-eaten apple is better than a bug any day. 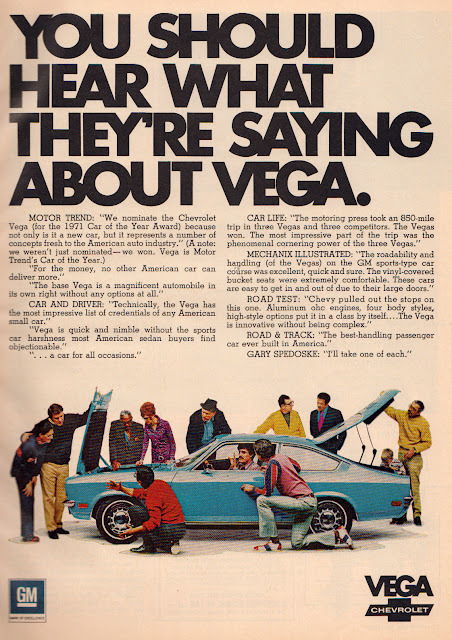 Forget the Pinto though, you should hear what they’re saying about the Chevy Vega! Feeling like a car is too much responsibility? 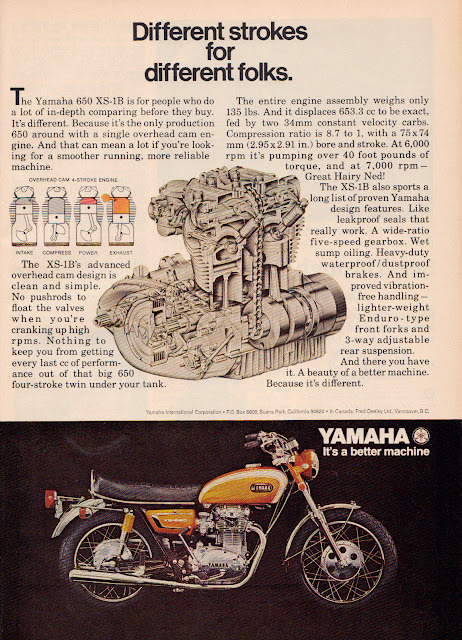 How about the Yamaha 650 XS-1B? Is even a motorcycle too much responsibility? Prefer to motor manfully over the snow or sand dunes rather than the city streets? 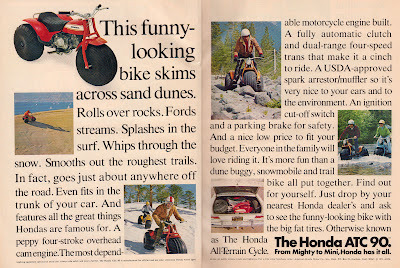 Try the Honda All-Terrain Cycle. Sure it looks like something Bozo the Clown would ride but that’s OK. It takes on those sand dunes like a champ and doesn’t require a driver’s license in the event you somehow got enough DUIs to lose it back in 1971. And when you’re done finding a job and driving around all day has left you thirsty, kick back and relax with a Schlitz. 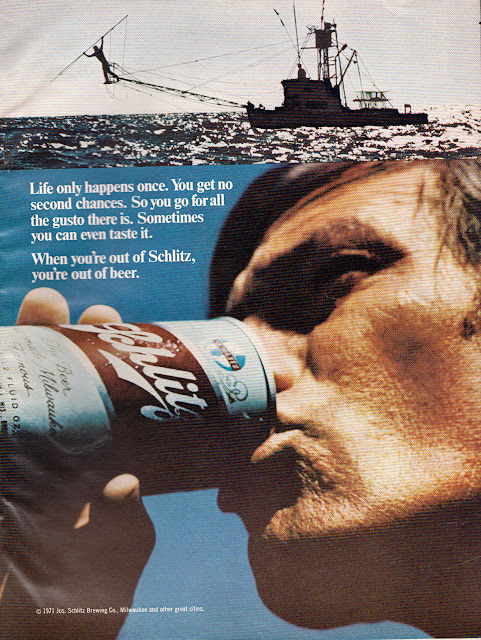 Because nothing tastes more like Schlitz than a Schlitz. And remember when you’re out of Schlitz, you’re out of beer. 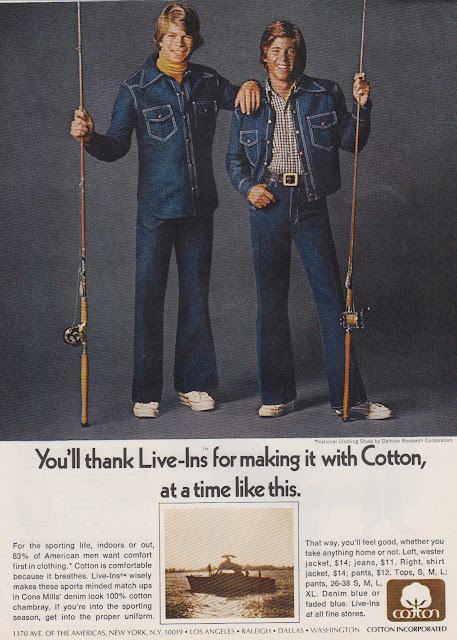 And you’re probably tan, and on a fishing boat. 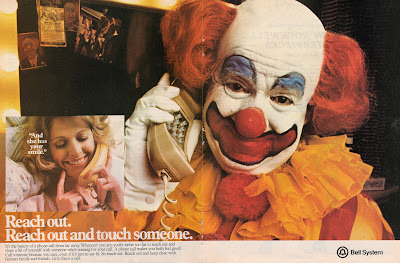 Well here it is the day before Christmas and I don’t know about you but to me nothing says “Holidays” like creepy clowns making long-distance phone calls. So harken back to the days when phones had cords and slogans like “Reach out and Touch Someone” didn’t have really uncomfortable subtexts.